Here is a revision taking into consideration The Rubberduck's great map. It largely avoids the problem I was trying to iron out in the last post by having only one corridor turn. This might actually be a good way to introduce that to a new mapper: when the party gets to that spot you pause and explain how you'll communicate distances at turns. This draft I also muted the room labels and corridor walls to try and make the map easier to read on the fly. It assumes wall sconces every ten feet, so the DM can just let the party know: "The corridor ends in a door three sconces away." I would love to see people key this up to their own tastes. Another advantage of having this first level all lit and having evenly spaced wall sconces, if you set up a nasty encounter that the party has to run from, presumably it will be easier for them to get their map bearings again once they've run to safety. In fact, I wonder if it might be a good idea to try to induce that, so that a mapper can learn how to start mapping somewhere else on their paper and eventually make sense of how the two fragments match up. Hmm, maybe there's something really bad in E.
Level two, as I imagine it,will have no lighting, and no sconces. It will have turns in corridors and doors that are not just at corridor ends. 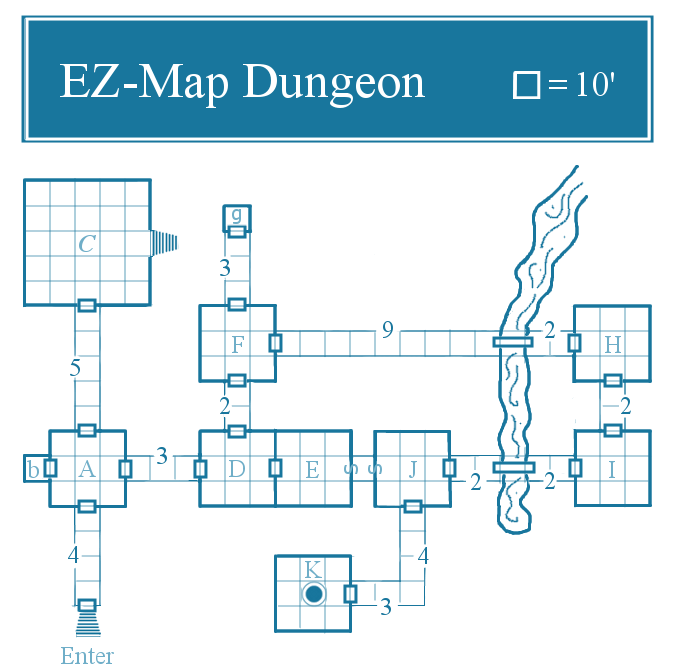 I'd also planned on roughly 12 rooms total, so this could fill about a session's worth of play. I know some of this is repetition, I'd intended to provide you with a spicy level two by now, but I foolishly merged all my levels in my image when I posted the last image. So I had to start all over. Ah well, the cool thing about DIY is that it forces you to learn new skills. A year ago, I don't think I had a clue what layers in image editing software were for. Now, for this last pic I'm working with 7 layers (like a bean dip, hah) and it makes it a ton easier to make changes to the map. Nice work, man. I admire your tenacity. Looks nice, I really like how clean and clear it turned out. I think any new GM could easily understand and explain this dungeon to a new group of players. Does the lower cased letters indicate secret rooms (like the "b" adjacent to room "A")? I'd probably used it that way, to avoid cluttering up the walls with S's or C's. I also like the way the stairs are pictured ("outside" of the rooms, if that makes sense). @Jensan: I meant b and g to be "small" rooms the others are "medium" except for C which is "Large". This is looking great! I, personally, would drop the uppercase/lowercase distinction on the map. It does lead one to assume there is something special about the room other than the size. I mean, I can see it's smaller, so why bother? Also, in that stub of corridor leading to room K - you went with 3 not 2? So you could leave the description to the decision of the DM? Hey Koren, I was thinking the labeling might become more important if the scale were 5' per square or if we start using more variety of room size, or weird room shapes. But to introduce the DM to the idea now, even thought it might be obvious, that we'll be talking about rooms as large, medium, small. I was thinking of using colors or patterns but that might be even more visually distracting. As for the stub, I could leave that as "X" or "?" and have notes that the DM should decide on one system or the other to use consistently and communicate which it is to the player. Hopefully the players get to that hall. But, actually, I can put some unavoidable turns that will bring up the issue on Level 2. You seem to be assuming that corridors are always square. I've drawn one map where the sides of the walls in a corridor were triangular alcoves and it worked pretty well. Of course that may not fit the architectural mores of the builders, but I wanted to throw it out there that square isn't a requirement. True, but the point was to make something easy to map. Square seems to reign supreme here especially considering most people are using square graph paper.